Picture this: you’re 50 years old, your career is dying on the vine – your entire industry is on life support – and you need to find a new career to carry you through the rest of your life. Sadly – it and gladly – this situation was not hypothetical. It was my reality. I say “sadly” because it was an incredibly stressful situation to go through, especially having a family to support while it was unfolding. But I also say “gladly” because overcoming crisis is an amazingly empowering experience. That was my situation at the tail end of 2008/beginning of 2009. But by the middle of 2011 I had a career designation unlike any I ever expected to have in my life: professional blogger. Not a common job description, especially for someone over 50, but I blog and I make money doing it. How much money? Enough to make a living! That’s plenty for a guy who, based on age and career circumstances, could have easily have been considered to be “washed up”. But there’s something I’ve learned about blogging – something much more encouraging: it’s one of those fields where the farther you go, the farther you can go. Think of it as “success breeding success”. It’s very real in blogging. About a year after launching my blog, and earning advertising revenues from it, I also began writing for other blogs. That as the beginning of my freelance blog writing career, that eventually developed into my primary source of income. I now make more money than I ever did in a “real job”. It’s what happens when you actually like what you do, and you gain greater control over your working life. Hundreds, maybe thousands of people are making money blogging – but what IS different in my case is my highly unlikely background. I don’t fit the description of the usual professional blogger. That’s a person who’s typically in his or her 20s or 30s, has grown up with computers the way people my age did with TVs, has few inhibitions in regard to “transparency”, navigates the social media with ease and confidence, and generally has at least some professional connection to the IT universe. I can lay claim to none of that. And I hope you find some encouragement in that. For me, entering, continuing, and extending my blogging career has been akin to building a brick wall, one brick at a time. But the take away, I hope, is that you’ll see that you can turn something as casual sounding as blogging into a legitimate career. I’m telling my story in the hope that it might motivate you if you feel trapped by economic or employment circumstances. There is a way out – there almost always is. What do You do When All the Doors are Closing? A career crisis is a disaster at any age. But once you reach the half century mark, all of the problems are magnified. You’re too young to retire, but too old to start a new career. And compounding the problem is that age discrimination is as real as it is under-reported. Going back to school to get a new degree costs time and money you don’t have. As well, the time horizon to use the new skills learned is too short if you could. Employers in new career fields are unwilling to take a chance hiring you into an entry level position. They can easily hire younger people who are uncorrupted by previous experience and generally willing to work for less money. And that jumping-into-a-parallel-field thing is vastly over-rated. That was especially true back during the latest edition of the “worst downturn since the Great Depression”. When you’re facing a conundrum like that, you can either cave-in, lose your self-esteem and “settle for whatever you can get” to carry you to the day when you’ll be eligible to collect a meager Social Security check – or you can come out fighting. I chose to come out fighting. It wasn’t even close. But one of the most difficult things for a suddenly disenfranchised person (a description I never thought would apply to me) to do is to find a way to think long-term in a world where your economic underpinnings have been virtually annihilated. The only rational course in that situation is to make an end run around the immediate problem. That meant taking a chance on something completely new. I chose blogging. In my world, that’s was as new as it gets. Blogging doesn’t top the list of places to find career salvation. More typically, teaching, government jobs, IT or “something in the medical field” come to mind when people look to re-tool. Then there’s the usual mid-life rest stops: real estate, insurance and car sales. Or the various assorted “franchise opportunities”. All of which seldom work for people who have no entrepreneurial background. But blogging has one quality that none of those have: it’s the modern equivalent of the Wild West. It’s a world so undefined that even a complete but determined novice like me had a chance make a go of it. It was chaos, and that’s where I chose to cast my lot. But not without reason. I think it was Ted Turner who said something along the lines of “If you want to make money, find the place where the action is, jump in the middle of it, and money will come to you”. That’s a very loose paraphrase and I might not have it completely right. But it actually makes sense when you don’t know what else to do – and I didn’t. Blogging seemed to be that place. Being an analytical type, I actually sat down and did T-account analyses to determine what my next “gig” would be. Positive qualities to the left, negatives to the right. If a given field seemed to have a much higher number of positives than negatives, it was in contention. Low or no capital investment. It also needed to have little or no government regulation. I was coming out of the mortgage business and saw it regulated into oblivion. But that’s a story for a different day. Blogging came up better than any other field I could think of, making it the “logical choice”, if you can believe as much. The new field also needed to fit my skill set, and that wasn’t as apparent. As I’ve already revealed, I didn’t fit within the blogging “demographic”. I didn’t have any IT familiarity and came from a generation where bearing our souls (and personal information) to others was considered out-of-bounds. But I did have some skills that I thought would help. Though I’d never made money writing at any time in my life, I always thought of myself as a closet writer. I’m also a deep and generally unrestrained thinker – that fits well in a Wild West environment. And I had business and finance related experience from my mortgage career, and an earlier stint in public accounting. Not a whole lot to go on, but it was a start. I figured that if nothing else, I’d get the content part of blogging down quickly. And here’s one other seemingly unlikely factor I had in my favor: I literally had no place else to go. That can create a level of dedication that those with more options can never muster. So I mounted my horse, and rode out into the sunrise of the modern equivalent of the Wild West. God helped me in my journey, and no one can convince me otherwise. At the time, blogging had only been around since roughly the early-2000s, so it was very much a field still in its infancy. Because of this newness, it was and still is very much a blank canvass. It’s a place where a novice is free to take chances, and quite literally as many as he or she wants. You can even mess up, and still move on. I know I did – several times along the way. This is very unlike the current employment scene where work flows and procedures are becoming increasingly precise and technocratic. That’s now true of even the simplest of jobs. That’s the whole reason blogging appealed to me. We all have hidden talents, and blogging looked like the place where I could tap mine. But chaos has its price too. I read as many blogs and published sources on the business of blogging as I could find. One thing became crystal clear in the early going: blogging is NOT an exact science. What works for one blogger won’t necessarily work for another. Damn, no road map! At least not back then. If you want to become a blogger, you should certainly gather all the information you can, especially from successful bloggers. Some of it WILL work for you – just don’t get discouraged if it doesn’t. Blogging is a work-in-progress and much of it will depend on plain, old trial-and-error. But then that’s the way most things in life works, if we’re perfectly honest. 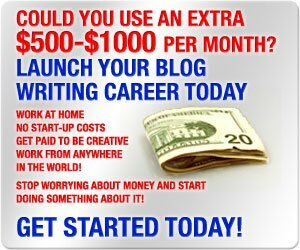 I didn’t start making even a few hundred dollars a month until I was blogging for at least a year. It took me two years to hit the $1,000 monthly level. Some people start making money after just six months, but understand that these are exceptional cases. The vast majority of blogs never make any money at all, and most fail within the first year. I didn’t fail because I didn’t quit! I was done with the mortgage business, but I took all kinds of temporary and contract jobs while I was building my blog. Some of them interfered with my blogging, but I needed the money. There’s a definite “starving artist” quality to building a blog, but if you think of the outside jobs as supporting the building of your business it can actually turn it into an adventure that also provides you with material for writing content. After being out of my original field of accounting for too many years, I landed a steady contract arrangement with a small CPA firm. I continued that for six years while blogging. I only stopped doing it when my family and I moved to New Hampshire (which we were able to do precisely because of my blogging). At that point I’d built up my income to the point where I no longer needed a supplement. But you do what you have to in the meantime. I had no choice because the mortgage business had blown up. But if you have a full-time job, you already have a built in cash flow to support your new blogging venture. I’ve been describing blogging as chaotic. And while that can certainly confuse and even sabotage your efforts to succeed, it also presents opportunities. Once your blog begins to get traffic, others in related businesses begin to notice. Advertising and affiliate deals, partnerships, networking arrangements – you name it – will begin showing up in your email. Many of them will be a complete waste of your time. But some will be serious and profitable. Carefully consider as many as you can. Because the web is wide open, blogging can take you in all kinds of directions that you never expected. For example, about a year after I started my blog, I was offered a paid staff writing gig with another website. I accepted, and within a few months I had paid writing gigs on several sites. At the time it became a nice side income. Today, most of my blogging income is from freelance blog writing. It’s turned into an incredible way to build my blogging income from multiple sites. Part of finding success on the road into the unknown is finding people to make the journey with. One of the greatest blessings of the blogging world is that there are so many people you can team up with. I’ve met dozens, and I’m going to say without reservation that this is the greatest group of people I’ve ever had the pleasure to work with. All are succeeding in their own ventures, all are entrepreneurs, and all need one another to make it work. For several years I was in a networking group where we thought of each other as “co-workers”. We had all of the benefits of co-worker support, but none of the burdens. You’ll need to find such support. If I could pick one quality that separates success from failure, it’s definitely this one. You have to become almost single-minded, blocking out and even ignoring distractions. No matter what, keep moving forward! While I was working in contract assignments – and enjoying the money of the moment – I never lost sight of the fact that the assignments were temporary. But my blogging was permanent! Constant, forward motion has a way of getting you to where you want to go, even if it takes longer than you expect. Whether you go into blogging or any other venture, you won’t succeed without being relentless. I now apply that mindset to most things I do, and it works. It can even make up for weaknesses elsewhere in your professional repertoire. That may seem like a lot to summon up, especially if you’ve never built your own business in the past. But as difficult as it seems, the payoffs of succeeding are even greater. Here are some of the many benefits I’ve gotten from my foray into blogging venture. You can expect the same if you decide to give it a serious try. I have my own business. An income generating blog is a legitimate business. Some are even selling for substantial amounts of money. In today’s economy, being self-employed is more secure than being on someone else’s payroll – especially as you get older. My future is unlimited. While other people my age are worried about keeping their jobs, I’m working on growing my business. At an age where so many are planning on folding up their tents, I’m contemplating the infinite possibilities. I love what I do. I’ve never been able to say that about any job or career I’ve had in the past. I don’t have to retire. The whole idea of “putting in your time” to retire at a given point never sat well with me. If I retire I want it to be because I want to, not because I have to. Blogging flows with my life. I work at home, on my own time. And I’m free to pursue other opportunities. I have geographic mobility. Since I’m no longer job dependent, I can live anywhere in the world that has electricity and an internet connection. My entire business can be “stored” in my head or on a flash drive. And both are portable. Are YOU Ready to Give Blogging a Try? I’m here to tell you that you can make money blogging, even if you don’t have any “prequalifications”. Or even if you think you’re too old. I was 50 when I started and I’m no whiz kid of any kind. But here I am, working through my mid-life career crisis with a plunge into what was until a few years ago, the complete unknown. If I can do this, so can you. Blogging is more “art” than “science” but you still need a road map if you want to do it quickly and effectively. If you’re stepping into blogging or plan to soon, check out this step-by-step series from Bob Lotich and Jonathan Milligan, two of the best bloggers in the business. 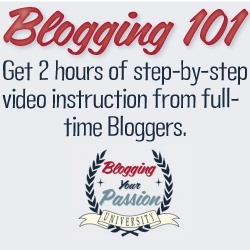 It will guide you through the process from start to profitability: Blogging Your Passion University 101. (Please be advised that I will receive compensation if you sign up for this program). Have you ever thought about blogging as a business? What keeps you from moving forward with it? Hi Weston–There’s hope at just about any age. I know several people who’ve made major career changes (usually into self-employment) in middle age, and I’m going to try to get them to share their stories. The media are ga-ga over 20-something whiz kids making billions out of the gate, but the success stories of more “ordinary” people are no less spectacular–and much more relevant for the majority of people. I am so glad you posted this article; you are not quite there yet in age but there are many seniors out there, and some them excellent writers no doubt, who should give blogging a whirl. I am certain many of them are just getting by and imagine how much of a difference an extra 1000 a month would make! It took me two and a half years to reach the monthly 1000 dollar mark, and there is no reason why others can’t do it. The trick is to focus on a niche or topic that is hot or up and coming, and stick with it; you will get there if you don’t quit. I felt like quitting many times but my pride and guts didn’t allow me to do it! Hi Sandra–thanks for sharing your own experience. I’ve written elsewhere on this site that many/most of us should consider developing some sort of business we can carry into retirement, to supplement a less-then-expected retirement income. You’re confirming that point (thanks again). I’ve also thought many times of the concept of one’s “life’s work”, which is a kind of dated concept but probably needs to be revived. We all have a contribution to make, and having some sort of business, whether it be blogging or something else, can keep us working, contributing and earning well past the age when employers think it’s time for us to be “put out to pasture”. I am so glad that I’ve found your blog. We need a lot of these down to earth, real life examples to have people understand: it is not coming in 30 days and it is not 1M buck it takes much longer and it brings unbelievable FREEDOM! Hi Attila–I couldn’t agree more. One of the problems we have right now with the disenfranchised is a sense of hopelessness, which is completely understandabble given the condition of the job market. But that means self-employment, as well as looking outside the box–become the only logical alternatives. And while that’s hard, especially if you’ve never been there, it’s very liberating when you get to the other side. I think the critical element is also converting the negative energy into forward motion. Get working on SOMETHING that offers a way forward, and keep going until you get there. For a lot of people–me included–there really is no other choice. Thank you for writing this. Your story sounds a bit like mine with few minor differences: I still have my job but am looking to change; I still have made less than $100 from my blog but that it is 10 months old this sounds OK; I am marginally younger than you and started blogging not long ago. I am not giving up anytime soon. My blog is growing, all my lines are going in the right direction and I am not going to let these young kids wipe the floor with me for long :). More seriously, I am so glad to have found a community that is so exciting and helpful. Hi Maria–Interesting point you make about having found a community. While the community aspect of the job world is breaking down in the every-man-for-himself struggle, it’s quite literally thriving on the web. Kindred souls seeking each other out I suppose. I agree, don’t give up even if the money isn’t coming in. There’s no right answer as to when money will flow in. When you’re starting out you need to concentrate on site content and networking. The money will come in it’s own time. Please be open to the opportunities that will come your way, some of them really are excellent arrangements. A good post and interesting to me – I was made redundant at 50, started working freelance; the business grew and I sold it 18 years later for what looked like a tidy sum. Then came the crunch, low return on investments + inflation. So I’ve started again, online and, you know what? I’m loving it! Hopefully, it will develop into an earner but, if it doesn’t, I’m having a ball! Hi Pat–Yes, that ability to follow your passions through self-employment can be addicting. I’ve noticed that some people are natural entrepreneurs–the idea of holding a job never occurs to them. Then there are the converts–like me–who cross that line and never come back. There’s so much that you can do with your own business, the flexibily is most definately one of the perks. And once you do it, you’re motivated to do it again. It isn’t a static situation in any way. Really interesting post, got the link from The Money Principle, and I have bookmarked your blog for further reading. I like your style, and I like that you have made a bad situation better on your own and seem to be thriving on it!! I will be reading more with interest. Hi Helen–Thank you for the compliments. I really believe that any of us can make a major transition, as long as we completely commit to doing it. While it could be that I had certain very subtle talents or skills that enabled me to make a change that seemed unlikely at first glance, I think that most people have hidden talents that will help them, and they may only discover them when they step out of their comfort zone and commit to doing something completely new. All of us are far more adaptable than we believe. Great post! All your points are valid and don’t quit really is the key. I’m almost 40 and will need to make some changes soon. Making money online is really like the wild wild west. People say what happens if something changed and your blog stop making money? I think we’re still in the frontier of making money online and we will be in a good position to take advantage of the next big thing. I think you’re hitting on the heart of the matter here. 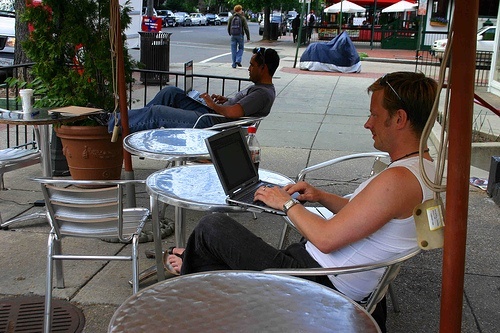 Earning a living on the web is more of a lifestyle than a career I think. You get into, recognize that it isn’t a “career” but way to make a living. It’s a dynamic environment, one that’s constantly evolving, and you learn to roll with the changes. You may not think you can do that before you get in, especially if you’ve always worked in traditional jobs. But you learn to go with the flow, and as you do you get better at it. Compared to many people making a living off the web, I’m an Old Dog, and yet I’m learning new tricks all the time. It actually feels good! If you’re flexible, you like change, and you’re open to learning, you can do this. That’s the part so many people miss. Knowing what I know now, if I had a full time job, I’d start doing something on the web as a side venture and be prepared to take as long as it does to make something start happening. I think this will only get bigger as time goes on. The world is now quite comfortable transacting business over thousands of miles, and the potential is endless. Since you are 50, can you share with us how much you saved for the past 25+ years after school? Would give the rest of us something to shoot for. Also, please let me know your thoughts on the average net worth in the post below for a 50 year old. Hi Sam–I know it’s become the norm for 20-somethings to bare all when it comes to income, assets, debts, etc, even to the point of pasting them on a website for all to see forever more, but to those of us in the “older generation” that kind of transparency isn’t the world we grew up in. Not even a hint Kevin? You don’t have to bare all, as I haven’t bared all at all. I believe, correct me if I’m wrong, but everyone should be able to retire and do nothing after 25-28 years of work. You don’t even need to blog to make money! 25-28 years of saving and investing! Hi Sam, the only thing I will say is that having money put aside definately helps in what ever you do, not just retirement. I agree that in THEORY everyone should be able to retire after 25 years of work, but real life doesn’t always cooperate with our best plans. Layoffs, medical problems, family crises, having kids (vs not having them) are all variables that do have an effect on the outcome. So do bear markets; one happening when you’re in your 50s is vastly different than having it happen in your 20s. Preparation–including saving and investing–is important, but flexibility when things don’t work according to plan is even more important. Do you agree? I think it’s a no brainer after 25 years. You’ll have to read my post, “Achieving Financial Freedom One Income Slice At A Time” for my thoughts. You’ll like it. Talks about around 10 different income streams. I’ll have to read it. Was this the first blog you started or was it a different site? Yes, the first. I did start another with a friend, but blogs are time consuming, and we let it go to seed. This has been interesting for me to read. I am older than 50, thinking of retiring early, as far as SS goes, but I still have a little window open to generate some revenue. I have had illness myself, and a grown child with a rare disease, and going through a divorce a few years ago which have all been financial setbacks. So your response explaining how life can get in the way of your plans, even financial plans really hit home. I have wondered if I would enjoy blogging and now that I may have a little breather I think I will jump in with both feet. I can focus on what really would make me happy and be interesting to others. I don’t have to be under pressure to hurry it up, but in time it could really come in handy for me to have added income later on doing something I enjoy. I am very encouraged by what I read here today. Hi Gail – I promise you this is all a true story, even if it isn’t the story book one you’ll read from other bloggers. But do jump in with both feet, and don’t be timid, or afraid to try things. Also, when you get in, let it lead you forward. What I’ve really been surprised at is how blogging creates opportunities. One of those opportunities could end up being your real destiny, or you may find yourself with multiple opportunities, some of them generating income, and some just being fun. It certainly beats sitting at home worrying, or feeling trapped in a job. Just be sure to give yourself plenty of time to find your way around. It’ll happen. And if you’re interested, the blogging course at the end of this article can really shorten the amount of time it takes to make it work. But however you do it, please don’t be afraid of what you don’t know. I went into it as a complete dope, and it’s worked better for me than anything else I’ve done in life. In so many ways, I feel like I’m living a dream – but it’s real. We deal with a lot of troubling big picture developments on this blog, but it’s really amazing the good things that can happen when you commit to changing direction. For me, life gave me no choice. But a lot of others who feel trapped could do the same thing I did, and so many thousands of others. After a while you feel yourself beginning to think differently than you did before, and it’s all exhilarating. I feel like I’m able to live life on a level I never could before. It doesn’t mean all your problems will go away, but it will make it easier to deal with them. Good luck to you! Enjoyable read as usual. Did you get involved with the dark arts of SEO? If you did, do you have any favourite tools? Hi Tim – I LOVE that description, “the dark arts of SEO”! I actually need to hone in on that. Since I mostly write for other blogs I’ve let that side of my blog slip. But there’s a lot to that, everything from how to construct content, to how to design the website. That’s why the Blogging Your Passion University 101 course is offered in this post. SEO wasn’t such a big deal 10 years ago, but it’s become it’s own art since. It would help to get a jump start on that at the very beginning, otherwise learning it is a long and very uphill climb. There are companies now that specialize in SEO but they cost too much for an upstart. I’d suggest either signing up for the course, or checking out some free websites on YouTube. But just remember the free sites are only going to take you so far. No one will simply give away the secret sauce. Also, there’s a difference between SEO for blogging and for other kinds of websites, so the general strategies may not apply. Great story, I did not know all of that even though I read your blog. It is inspirational how you took a scary time and made something good out of it. So many people just complain but never act, it takes role models like you to inspire action. I just blog for fun. Mostly because I don’t need to add to my retirement income, I don’t need the money I make now doing tech consulting, but I enjoy working a day or so a week to keep my skills sharp. Blogging is something else to me, a chance to share that is totally risk free. If nobody likes it, big deal, but sometimes they do. I like seeing how smart people do make money at it, and have done enough blogging to know it takes tons of time and persistence, like any job, to get good at it. Hi Steve – I was just emailing with another reader about how the desperation factor may have been one of my biggest advantages. Think about it – you’ll do whatever you need to when there’s no parachute strapped on your back. And I’m sure most people thought I was out of my mind just for investing time in it. But there are times when doing something “crazy” (in the conventional sense) is the most rational of all strategies. Thanks for sharing your experiences and how long it took you to make money from blogging. Thanks Tre. I wanted to stay as true to the real life way it played out as possible, and avoid the get-rich-quick hype that often accompanies these articles. Kevin, enjoyed the post, thank you for telling your story. I’m a few years older, work B2B sales in the corporate world and plan to retire in the next couple of years. I am intrigued by the idea of blogging. I do relate to your “unlikely” comment, “has few inhibitions in regard to transparency”. How did you push through this reluctance? Hi Jay – I don’t think I ever did. I have standards for what personal information and experiences I will release. For the most part, I limit it to anything I think is relevant to the subject at hand, and may be a benefit to readers. It’s really a matter of getting comfortable with a certain level of disclosure, and not going beyond it. I think we unconsciously do that with most things in life, so you find a way to work it out.